The Cedar Hotel patio at State and Rush streets. A developer wants to tear down this building to make way for an 18-story Viceroy Hotel. GOLD COAST — Plans to mostly tear down the Cedar Hotel at State and Rush streets and build a newer, taller inn in its place are still stuck on hold. A zoning application filed late last year by Chicago-based trader and developer Don Wilson to build an 18-story Viceroy Hotel at 1118 N. State St. was held by the Chicago City Council's zoning committee last month, public records show. The move generally means the legislation does not have enough votes to pass, but does not kill the proposal outright. Wilson's zoning application called for keeping the Cedar Hotel's brick-and-terra cotta facade, but otherwise demolishing the building and erecting a new, 180-room Viceroy Hotel on the property. A luxury brand, Los Angeles-based Viceroy Hotel Group operates five North American hotels in California, New York, Miami and Colorado, according to its website. A Viceroy spokeswoman and David Nelson, an executive at Wilson's Convexity Properties development company, did not return messages seeking comment. Wilson's proposal is the latest hospitality proposal for a site that has proved tricky for hoteliers. The actual Cedar Hotel, a onetime so-called single-room occupancy hotel, has long since shuttered and is better known now for its summertime bar patio. 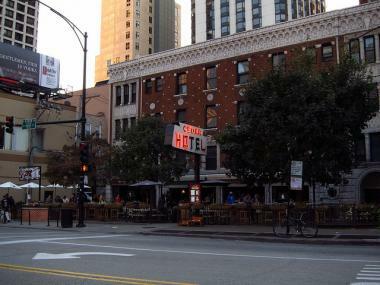 In 2007, Chicago developer Mark Hunt received city approval to build a 216-room Mondrian hotel on the site, but the plan collapsed in the wake of the global recession and Hunt relinquished the property to Wilson's development venture in 2011 after getting hit with a foreclosure suit. It is unclear why the Viceroy proposal has yet to proceed. The development site falls in the redrawn ward of Ald. Bob Fioretti (2nd), who is in the midst of a mayoral campaign. Fioretti and Ald. Danny Solis (25th), the chair of the city council's Committee on Zoning, Landmarks and Building Standards, did not return messages. If approved, the Viceroy would join a gaggle of new hotels swarming Downtown, including the newly-opened Virgin Hotel in the Loop, Soho House in the West Loop, and another Wilson development: a Loews hotel opening next month in Streeterville. A proprietary trader and founder of Chicago-based DRW Trading Group, Wilson has branched into development in recent years, with projects including a luxury 35-unit condominium tower at State and Elm streets, the aforementioned Loews hotel, and the redeveloped Esquire Theater on Oak Street. Wilson presented his plans last year to the Gold Coast Neighbors Association and were approved by the organization's zoning committee without major changes, according to Crain's Chicago Business.